My last Artisan Design Team project that I have to share this month is my favorite card that I made. I actually made this card first, before anything else. 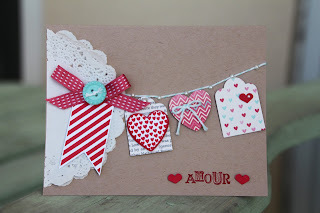 I love the way the Hearts a Flutter bundle works so well with the trendy "bunting" look. The doily and the bow add a bit of pretty to the card. Thank you so much for checking out my Artisan Design Team projects for January! !